Gold, Platinum and Silver have taken quite a hit in the last few weeks. To a lot of people these metals are investment and as such, they follow the prices quite intensely. I know my wife has been tracking their prices for quite a while. So she sees a loss in our portfolio from their highs to their present lows and points out to me that we could have purchased a BMW with our losses. The thing to realize here is that gold, silver and platinum have value not determined by any government. Their net worth at any point in time tends to be relative to wages in general. As a measure of worth, assume that an ounce of silver is one day’s wages, an ounce of gold is one week’s wages and an ounce of platinum is probably worth a lot more. Don’t hold me to the values stated; they are just a guide for survival. What you are looking at here is a way to preserve part of your wealth in a tangible way. 1,000 ounces of silver is going to provide you about three years of income if the dollar was to tank. One ounce of gold would pay the rent for a month. What we are really purchasing is peace of mind and security for the future. To a lot of people, if gold went to $10,000 an ounce, they would sell, but think about it. Has gold or silver really appreciated over time? In 50 years silver has risen from a dollar an ounce to about $20 an ounce. Real estate prices have risen in the same time span from $28,000 to $280,000. A pack of cigarettes has risen from 21 cents a pack to six dollars. Do you sell gold at $10,000 only to find out that a loaf of bread and a package of hot dogs is $5,000? If you think gold could drop to 30 dollars an ounce, do you think that cigarettes could drop back to a quarter a pack? So when you see the price of silver and gold drop, relax it is of little concern. Realize one thing, the reason you are holding them is because of government foolishness. Inflation is their mistress. Profit is not your motive; preservation of a portion of your wealth is the objective. Just as food for thought, in 1964, when I was being paid $2.00 per hour, I could buy 16 ounces of silver for a day worked. So take 16 oz. of silver time $22 spot today and you get $352. Divide that by 8 hours and you get $44 dollars an hour. I guess that explains why my mom didn’t have to work when I was a kid. People made real money back then. Our standard of living has dropped considerably, both the husband and wife work today. But by God, we are making 10 times the $5,000 my dad brought home a year—and paying 10 times more in taxes. Anybody catching on to what is happening???? Our employer gives us a pay raise because the government printed more dollars? We get happy. Are we getting richer? The raise feels good, it just doesn’t go very far. Many people believe that the US could be facing deflation similar to what happened in the 1930’s. And of course Ben always claims he’s running the printing presses to keep that from happening. Here is what happened during the Great Depression. The stock market crashed in 1929 and it wasn’t uncommon for someone on margin to lose 4 times their investment. Then in the 1930’s the banks collapsed. When it was all over, the average person with $10,000 in savings ended up with about $1,000, a loss of 90 percent of their accumulated wealth. There were no food stamps, welfare, social security, company retirement plans, credit cards or unemployment insurance. If you owned a home with a mortgage, you had a problem. Most home loans were for 5 years, and very few were being renewed the banks; they needed the cash. You either paid off the loan or lost the house to the bank. Consumption fell off a cliff in the 1930’s.If you had no money you were not in a position to stimulate the economy. If you were a business, sales were down to say the least. Most business of the time did not reduce wages, so in effect with the deflation your paycheck bought more (if you were employed). Let’s fast forward to today. We had a real estate crash and no one lost a dime. We had a bank collapse and all deposits were insured. The unemployed have two years of unemployment. Food stamps for all that apply. The stock and bond markets have rallied. The government is spending 150% of what it takes in in taxes each year. And of course, the national debt has increased to 17 trillion dollars. Washington is going to save us by spending what we don’t have to spend. If people want to argue over whether or not this is a global depression, be my guest. The real question is how long can government spending programs continue in this largess manner? No wonder, consumption has not fallen off of a cliff. 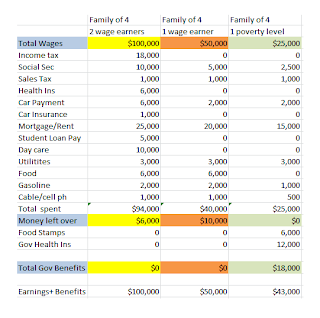 It’s irritating to say the least, that entitlement programs allow the user more freedom to manage their discretionary income (A cell phone and cable TV are essential necessities). Being unemployed does not make you homeless and broke. This time around, you can move in with mom and dad; most kids’ parents live longer now. Things are different this time. No money was lost, and failure was rewarded by bailouts and insurance. Low interest rates have literally ruined many retirement plans made 30 years ago with the assumption interest rates on savings would offer a return greater than inflation. The deflation of the 1930’s was caused by too little money chasing too many goods. In today’s world, we have too much money chasing too few goods. Plus there is the interest rate factor. Why not spend your earnings on immediate gratification? The future reward (interest) for deferred consumption just isn’t there. In today’s world, wages remain unchanged and purchasing power has decreased noticeably. World governments owe debts that cannot realistically ever be paid back. Just the thought of paying part of the debt off, creates riots in the streets; entitlements are where the cuts are made. The world in a global sense doesn’t appear to be clutches of deflation. People now have to work harder and longer to keep up with what they had the year before. Our standard of living is decreasing at a slow but noticeable rate. 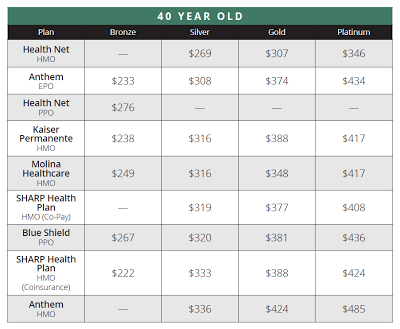 Next year many people in the US will earn the same amount but have $5,000 to $10,000 less to spend with the new health insurance. Technically the health care tax should plunge us into a deflationary spiral. But the thing that will be most noticeable will be the future decrease in Federal tax revenues collected. Bernanke will be just like the high school kid that smokes a couple of packs of cigarettes and thinks he can quit at any time. The printing will have to continue. The troubling thing I find right now is in the financial and real estate markets, people are so receptive to all of the experts. There is an answer and an explanation for every event. 40 years ago there was a complete disconnect between the experts and the markets -- That was the reason you had a stock broker, no layman could figure it out--IBM announced terrific profits and the stock dropped 15 points--go figure! In reality if the experts were any good at what they did, they wouldn’t have to work for a living; of course nobody’s going to point that out on a business program. So what’s it going to be, deflation or hyperinflation? Deflation would make the national debt a lot harder to pay off; of course that’s already an impossibility, even at these very low interest rates. Congress is on a roll, spend whatever you have and don’t have. What we need to realize here, is that we have a government machine borrowing our savings and spending it at a very fast and furious rate. Will we get it back when we go to retire? Do you expect the government to say "NO?" Ben's going to save us from deflation, well Go(l)d bless him. I can’t quite figure it out. It looks like they added more punch to the punch bowl. The party is on again. Housing prices are up 10% and stocks are climbing ever higher. It’s kind of hard to figure out what investor would loan money to home buyers at 3.5 percent interest for 30 years; maybe for one or two years, but not 30. You can get a better return on you dollars in the stock market. So let’s see how the game works. Ben buys all treasuries and real estate loans presented for sale. This keeps interest rates low. Since the banks are paying very little interest, retirees withdraw their retirement funds and “invest” it in the stock market. This makes stock prices rise and that increases the fervor to put more money in the market. Of course the low interest rate loans stimulate buying stocks on margin and increases commodity speculation. Borrowing a million or two to speculate in the oil market would only cost 30 to 60k per year. Plus it’s a business expense. Silver and gold are still dropping. The coin dealer I buy silver Maple leafs from, is out again. He can’t seem to order it fast enough. If we’re coming out of a recession, why is a bullion dealer running out of product? It reminds me of a movie theater; if you smell smoke, don’t yell “FIRE” until you get to the exit. Then we have the health care plan kicking in. 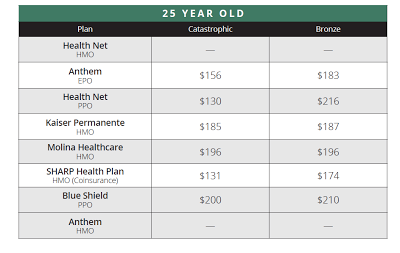 The young, if they want coverage, will be $130 a month at a minimum. 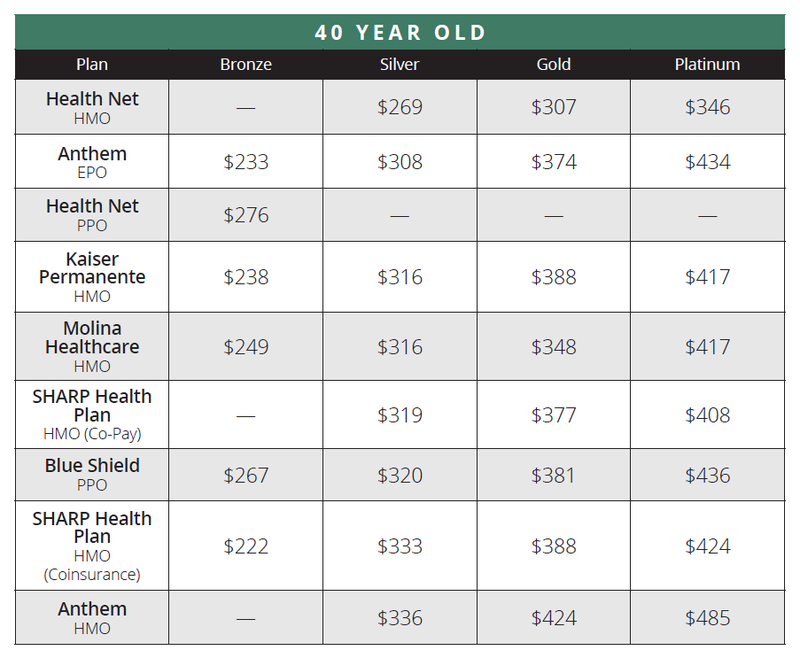 See the two charts below for pricing in Kalifornia. The penalty for not buying insurance will be $95 next year and go up to $695 per person in 2016-- to a max of $2085 for a family of three or more. Of course if you earn less than $9,500 a year, there is no fine. I’m not quite sure how this affects the future price of produce harvested in California. But if you do the math, for a family of 4, if the wife can’t make more than $10 per hour, she’s better off economically and financially, sitting home and taking care of the kids, while the husband works. Daycare is not cheap. 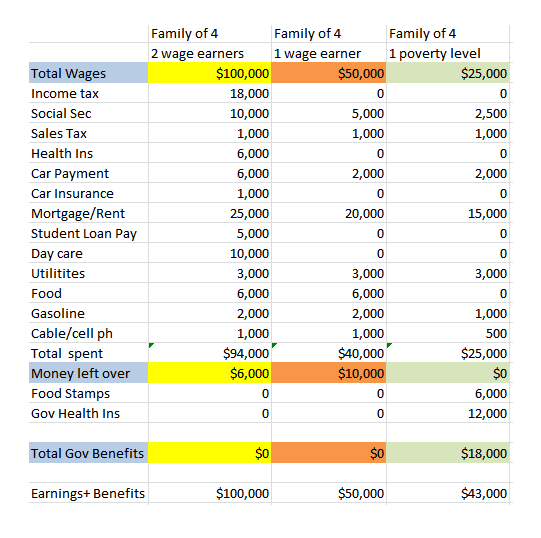 Notice if you earn less, you qualify for more benefits; whereas if you earn more, you qualify for a heavier dose of taxation. California announced that they went from a 25 billion dollar deficit to an 851 million surplus in a little more than 2 years. You do have to wonder what they “threw under the bus.” It sounds like someone from Disneyland is doing the state’s accounting. Of course there is not a peep about the state’s unfunded pension liabilities that have topped half a trillion dollars – six times the present state budget (study by Stanford Institute for Economic Research). The housing bubble is gone. Real estate is being bought as an investment that can return 3 to 6 percent over what the banks pay. What created this was a Federal Reserve policy. They have been buying the real estate paper and the redeemed treasuries – thus keeping interest rates low. It’s a little like squeezing a balloon, it pooches out in another direction. Seniors and investors now see the stock market as the “last bastion of investment” (fancy words for a bubble). There are two private sector bubbles; the bond market, the stock market, and then there is the national debt. The real question is, which shoe drops first-- -the bond market or the stock market? It’s a 50/50 call. You are going to buy puts either way. It will be a one two punch, one bubble will pop and then the other a little while later. And of course, there is the national debt, whose size nobody can even comprehend. The one economic condition that could collapse this house of cards is Obama’s health care. What would have gone for vehicle insurance in many family budgets, will now go for health insurance. One of the things that made America great was the ability of each family to choose what they spent their earning on. Naturally they neglected saving for retirement and health care in order to give their kids a chance at a better life. Money used wisely is a tool you use to craft your life like a carpenter building a house. Each person individually tries to determine their own destiny. So follow the chain: no car insurance---you wreck your car or have it stolen--you lose your job because you can't get to it-- money problems lead to a divorce and drugs,---downhill from there. The poor are being set up for failure. It reminds me of the story about the battle that was lost over a missing nail in a horseshoe. The real question is this, how do higher taxes and more government regulations induce increased economic prosperity? Common sense suggests that the people with all of the answers, are part of the problem. Economic issues are never solved by government, only shifted into another direction. Every student in the US is entitled to a college education with government financing. If enough people graduate, you might just need a degree to get a job flipping hamburgers. But I digress; the economy is just doing great. It's the people around me that aren't.